In some instances, the Probate Court may oversee the division of property for someone who has died. This property is called a "decedent's estate." The Court supervises the assets and liabilities of people who die while they are residents of California or who leave property inside the state. This includes payment of the deceased person's debts and the distribution of property to beneficiaries. A deceased person's estate will not be handled in probate court if there is a surviving spouse and the estate consists entirely of community property, or the property is held in joint tenancy with another person. Property transferred by gift before death, or placed into certain types of "living trusts," also is not subject to probate. 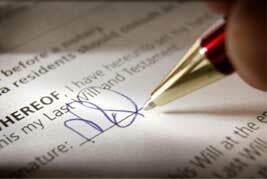 If the person has written a will at the time of death, he is said to have died "testate." If there was no will, the person is said to have died "intestate." If no will exists, the property ("estate") is divided among the decedent's heirs. In California, if the decedent has a spouse and/or children, the property first goes to them. If there is no spouse or children, the property goes to the decedent's next nearest relatives. In these cases, the Court will appoint an administrator to manage and distribute the assets. This person is known as the "executor." If there is a will, the Court will make sure it is valid. The property is then distributed as directed by the will. The person who oversees the estate under the terms of the will is usually the person who is named to be the executor in the will. If the will does not name an executor or the person named in the will does not want to serve in that way, the Court will appoint someone to manage and distribute the assets. Sometimes a full probate proceeding is not needed. This would be true if the estate is not worth more than $100,000. Another example would be if all assets go to the decedent's spouse. Within thirty (30) calendar days after a person dies, the individual who is in possession of the decedent's will must file it with the Court. Trustees, or beneficiaries, or the trust may petition the Court to remove the trustee, release assets held by the trustee, amend the trust instrument, appoint successor trustees, appoint receivers, notify creditors, and make other orders necessary to ensure the timely and appropriate distribution of the trust's assets.